With a range of options to consider, from cut to colour, it can be difficult to find the ideal wedding band to complement your engagement ring. Here, Bhria Vellnagel enlists the knowledge of Janelle Potts from Wynelle to help take the guesswork out of this pairing. There is no jewellery duo more renowned in society than the engagement and wedding ring. When deciding on your wedding band, it should reflect your personality and style, while also complementing your engagement ring. As you’ll be wearing the ring every day, you’ll want to be confident that you’re making the right decision. Whether you’re a fan of rose gold, vintage-style engraving or show-stopping diamonds, you’ll need to find a band that will coincide with your beautiful engagement ring. While Potts doesn’t believe in a ‘safe option’, choosing a band that mirrors some of the same elements of your engagement ring, such as its gem, shape and cut, will ensure you find a cohesive coupling. As many brides move further from traditional wedding rings, coloured stones seem to be replacing diamonds in wedding bands, with some of the most popular gems including sapphires and rubies. Coloured diamonds, such as Australian pink Argyle diamonds, have also become increasingly popular in recent years due to their rarity. Potts says fancy shape diamonds, such as pear, oval and square, are also currently trending among brides-to-be. “[They] tend to produce the illusion of a larger carat size, [without the price tag],” she explains. Extravagantly sized diamonds, such as Paris Hilton’s impressive teardrop-shaped engagement ring, often require a little extra space between the two rings to provide a comfortable fit. To compensate for a large diamond, a curved, angled or custom wedding band is a fashionable choice. In Potts’ experience, pavé-set wedding bands, which feature a row of small diamonds, are one of the most versatile designs on the market. “They’re a real statement piece… but also accentuate your set,” she says. To ensure a perfect match, the gems of your pavé band can be customised to mimic the cut and shape of your engagement ring. “Whether [it features] round, cushion, oval, or emerald-cut [gems], [this style of ring] can be worn… by itself or as a set,” Potts says. years of professional experience in ring pairing, the jeweller will inspect your engagement ring and provide you with a number of options to select from, or a bespoke design. 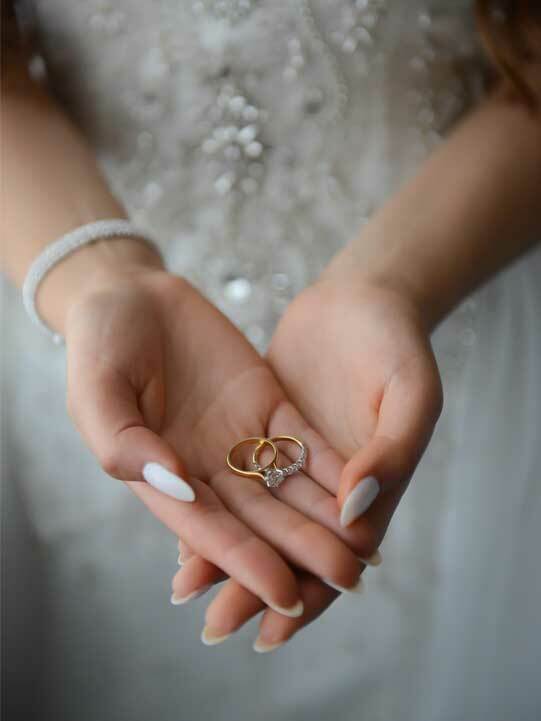 As the protruding stones of engagement rings can be easily damaged, it’s common practice for married women to revert to wearing only their wedding band. However, even wedding rings with small gems or thick bands can become worn over time. Despite this, Potts says your lifestyle or workplace shouldn’t impact which ring you choose. “[Your] workplace shouldn’t ultimately influence [your] design choices, [as] precious jewellery should always be removed… when [you perform] any physical activity,” she says. If you want to follow in the footsteps of the ruling royals, then a simple gold band is a wise choice. Not only is this precious metal easy to care for, but it also has a lower chance of becoming damaged. Instead of including valuable gems that require regular maintenance, you can opt for a ring with an artistic engraving, such as a timeless floral pattern or some loving words from your significant other. If you work with your hands on a daily basis, a wedding band made of platinum is the most resilient option. “Of all the precious metal, platinum remains our most popular as it… shows the least amount of wear and tear,” Potts says. With a vast range of wedding ring styles to choose from, finding the perfect one can be difficult. However, whether your engagement ring features coloured gems or a statement diamond, by adhering to the aforementioned advice, you’re sure to find your perfect match.